I found it interesting when all the possible love songs in the world are narrowed down to just three songs to represent this incredibly large and diverse genre. A store sold musical balloons for Valentine’s Day with only a choice of three songs – “Got My Mind Set on You” the George Harrison version, “You’re the One that I Want” from the movie “Grease”, and “Hooked on a Feeling”. Of course I prefer the George Harrison song but I don’t think it’s his most romantic song. “Something” and “Old Brown Shoe” come to mind before that cover song. The song from “Grease” is fun but problematic when you consider the scene from the movie where the song appears. Danny makes positive changes to his life to impress Sandy such as giving up smoking and exercising. While Sandy takes up smoking and dressing slutty to attract Danny. So who really is the one that they want? The one who they really are or the one that they become to impress each other? “Hooked on a Feeling” is not the most romantic song as it is more about lust than romantic, lasting love. Plus, whenever I hear that song, I think of the dancing baby on the TV show “Ally McBeal”. Hallmark, the greeting card company, actually sold vinyl 45 records with their Valentine greeting cards. The three records chosen were Bruno Mars’ “Just the Way You Are”/”Marry You”, Aretha Frankin’s “Respect”/”Think”, and INXS’ “Need You Tonight”/”Never Tear Us Apart”. Again, I am not sure these are the best love songs to represent all love songs. Even being limited to just Atlantic Records recording artists would yield a huge amount of love songs. (For example, my favorite Phil Collins who released a compilation actually called “Love Songs”). The Bruno Mars songs are appropriate, romantic, and current. The Aretha Franklin songs are more warnings to men than love songs. “Need You Tonight” like “Hooked on a Feeling” is more about lust than love. While “Never Tear Us Apart” seems romantically appropriate. I’m surprised that INXS was included with the amazing Bruno Mars and the legendary Aretha Franklin. If not for the quirky fact that my workplace actually plays those two INXS songs on an almost daily basis, I probably wouldn’t have heard those songs since they came out thirty years ago. Songs do send messages so the musical balloons or records with the greeting cards given to a sweetheart on Valentine’s Day could be a way of sending a message that may not be as romantic as the occasion calls for. Of course it’s hard to narrow down a huge genre to less than 10 representative songs. I just found it interesting which songs were chosen to represent that love. Guitar Train passengers, what three songs would you choose to represent Valentine’s Day? 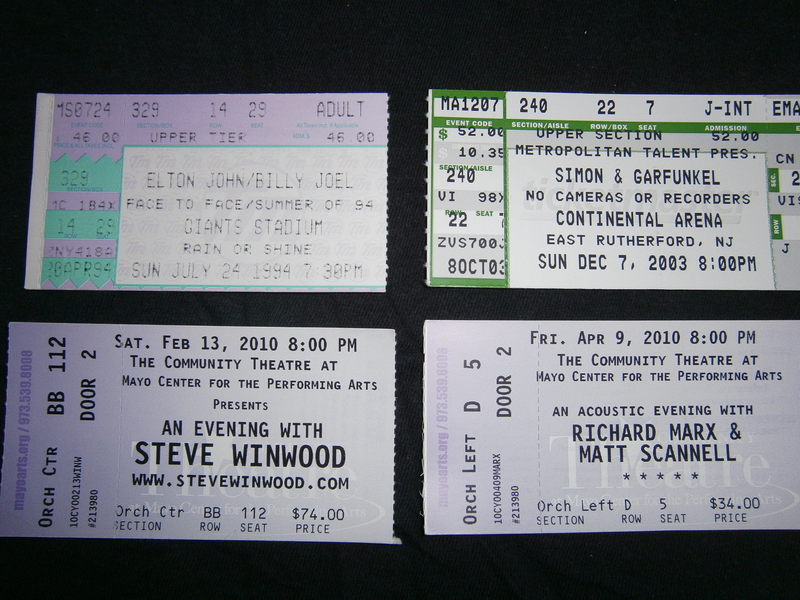 Again, as with the other Guitar Train stops about Billy Joel, Elton John, and Richard Marx, I only listened to the hit songs of Steve Winwood. Most of those hits were from the 80’s so I have decades of songs to listen to if I want to explore more of Steve Winwood’s solo work and in various bands. Guitar Tran passengers, what are your favorite Steve Winwood songs? Continuing my monthly list of top favorite songs of musicians I like other than my absolute faves, this month’s musician is Richard Marx. I was fortunate to see him in concert in 2010 as a duo with Matt Scannell from Vertical Horizon. It was an acoustic set with just the two of them on stage in a small theater. They were very personable – funny and humble. What I liked most was how they would give some background about writing a song before they sang the song. I was a fan of Richard Marx in the 80’s but I always resisted buying his CDs telling myself I’d wait until his greatest hits CD came out. Maybe now is the time to revisit all his CDs, not just his hits. Guitar Train passengers, what are your favorite Richard Marx songs? At the last Guitar Train stop, Quirky T looked at New York songs so now it’s time for California songs. I have not spent nearly as much time in California as I have in New York (it’s a long Guitar Train ride to get to the West Coast) so I am biased towards New York and its familiarity. 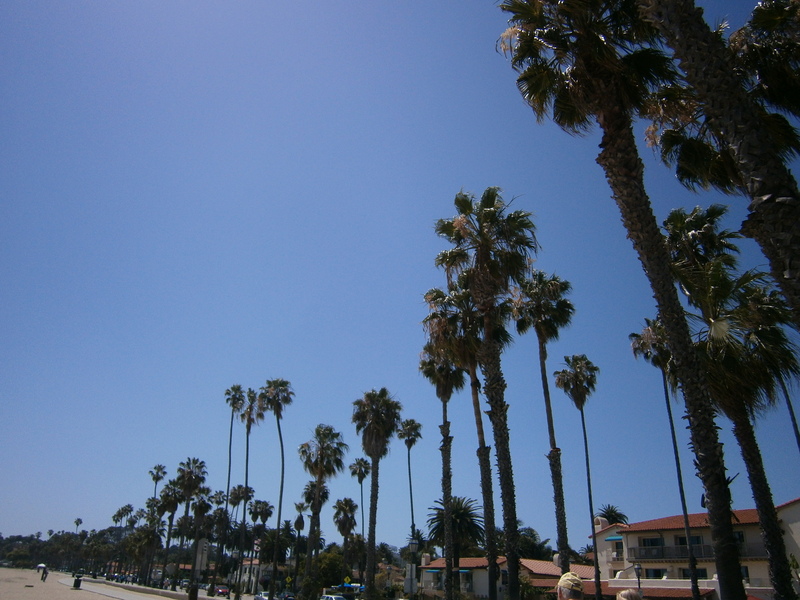 Many California songs make the state into a dreamy paradise while New York (especially New York City) is more gritty and one has to be tough to survive the weather, the congestion, the fast pace, and the people. Billy Joel also had a song on my list of New York songs I like. He is a New York guy but he lived in California for a few years in the 1970’s which inspired him in writing some songs such as this one on my list. 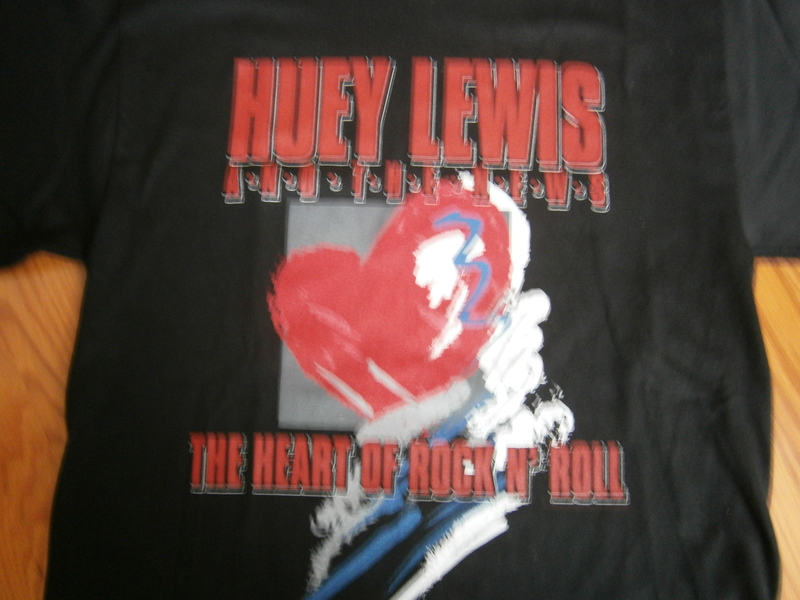 One song which mentions both New York City and Los Angeles is “The Heart of Rock and Roll” by the San Francisco, CA band Huey Lewis and the News. Actually, New York starts off the song and LA is mentioned later in the song. Along with those two cities, several other rocking cities throughout the United States are named. Before the Guitar Train departs for the next stop, I have one California video mention. For some unknown to Quirky T reason, the British band Genesis filmed the video for their song “Misunderstanding” in Los Angeles. Every time I watch the video, I think, “Yeah, Phil, there is a misunderstanding. 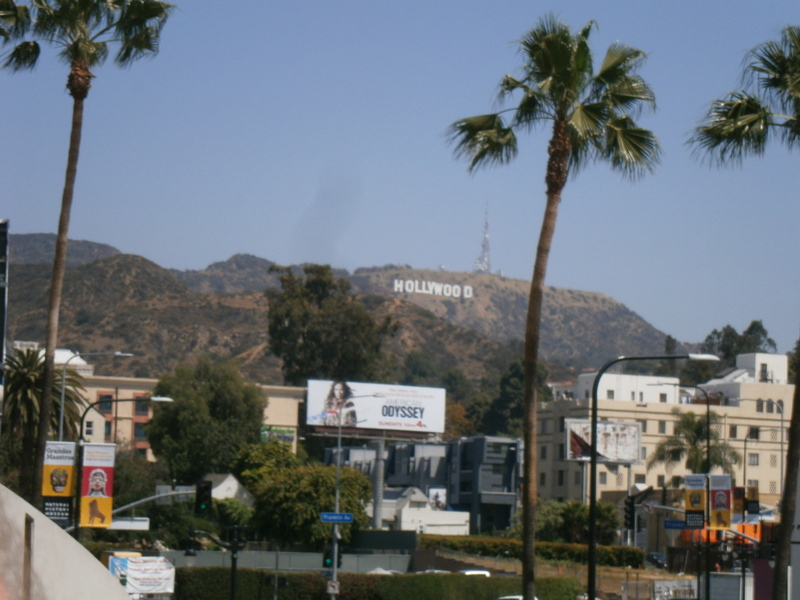 You’re driving around LA looking for your girlfriend and she’s back home in England.” That being thought, I do like to watch videos, TV shows, and films shot in California to see locations I don’t normally see just as I like to watch videos, TV shows, and films shot in New York City to see locations which are familiar to me. Guitar Train passengers, what are your favorite California songs? Get your tickets ready as next month Quirky T conducts the Guitar Train to go “Back in Time” to 1985! To continue the theme of Concert Month on the Guitar Train, Quirky T is looking at concerts she wishes she had attended. Obviously, the top of that list is The Beatles. Having been born years after they broke up, I didn’t get a chance to see them live. That statement is probably true for many Beatles fans. 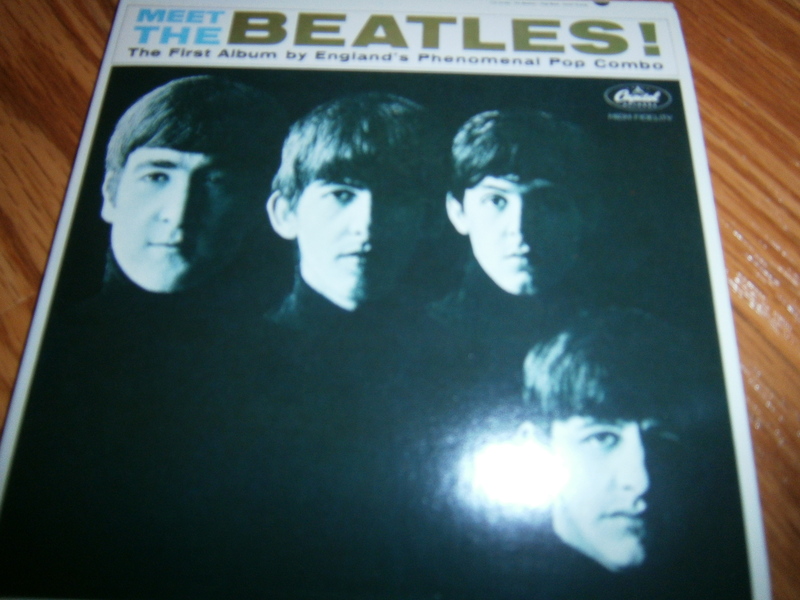 From the footage I have seen of Beatles concerts, as a concert experience, it probably was not the best. Audio was primitive in the 60’s compared to now so I probably wouldn’t have heard any of the great music over all the girls (including me) screaming. Depending where I sat, I probably wouldn’t have even seen the band as there weren’t any video screens showing close-ups of the stage. Despite all that, just to be at a Beatles concert and experience that atmosphere would have been amazing. Other concerts I wish I had seen are not as monumental as The Beatles. Musicians I had a chance to see in concert but didn’t are Wilson Phillips opening for Richard Marx, The Temptations with The Four Tops, The Pointer Sisters, and Bruce Springsteen. 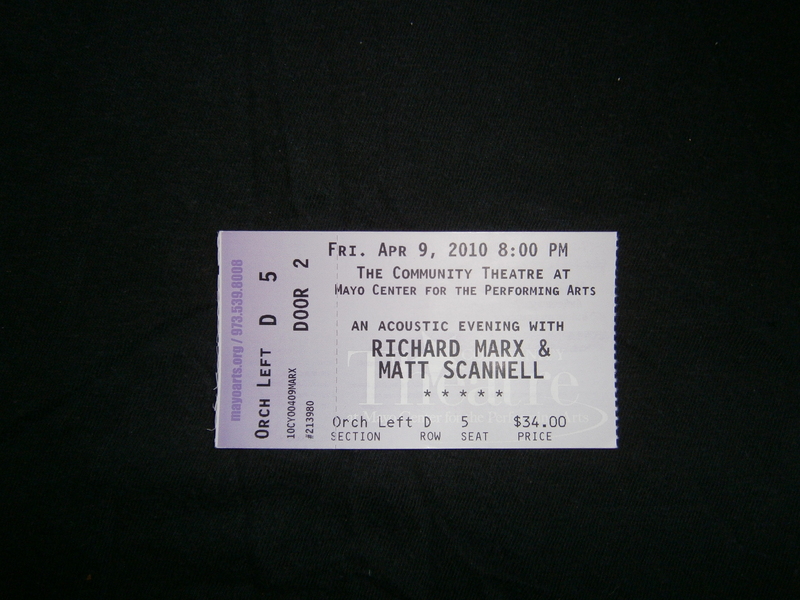 The Wilson Phillips/ Richard Marx concert in 1990 was too far away for me to attend but I did end up seeing Richard Marx in concert 20 years later. A few years ago, a concert combining The Temptations and The Four Tops was a passing interest that I regret not acting on because it would have been amazing to see the two legendary groups together. They are still touring together so I may still have a chance to see them. Another passing interest that I did not act on was a Pointer Sisters concert in 2006. It would have been fun to hear their songs which I loved listening to in the 1980’s. I will go more in-depth about why I was not able to go to a Bruce Springsteen concert in the Guitar Train’s next stop looking at the agony of Ticketmaster. As a result, I am probably one of the few people in New Jersey that has not seen the legendary New Jersey musician in concert. I can’t go back in time and attend any of those concerts so I have to make sure I don’t miss any concerts which interest me in the future. Guitar Train passengers, what concerts do you regret that you didn’t attend? Welcome to Concert Month on the Guitar Train. This month Quirky T looks at concerts she’s attended, concerts she wishes she had attended, Ticketmaster, and her favorite concert moments. I’m so fortunate to have seen all my favorites except The Beatles in concert. I have seen Paul McCartney three times, Genesis twice, Phil Collins (solo) three times, Gloria Estefan four times, Huey Lewis and The News twice, Jon Secada once, and Barry Manilow twice. I enjoyed all of these performances. There is nothing that can compare to hearing your favorite songs performed live. Since listening to music can be a solo activity, it always amazes me to be at a concert surrounded by thousands of fans who like the same music I do. I have also been to concerts by musicians I like but not as much as my favorites. They were Elton John and Billy Joel together, Simon and Garfunkel, Steve Winwood, and Richard Marx and Matt Scannell together. 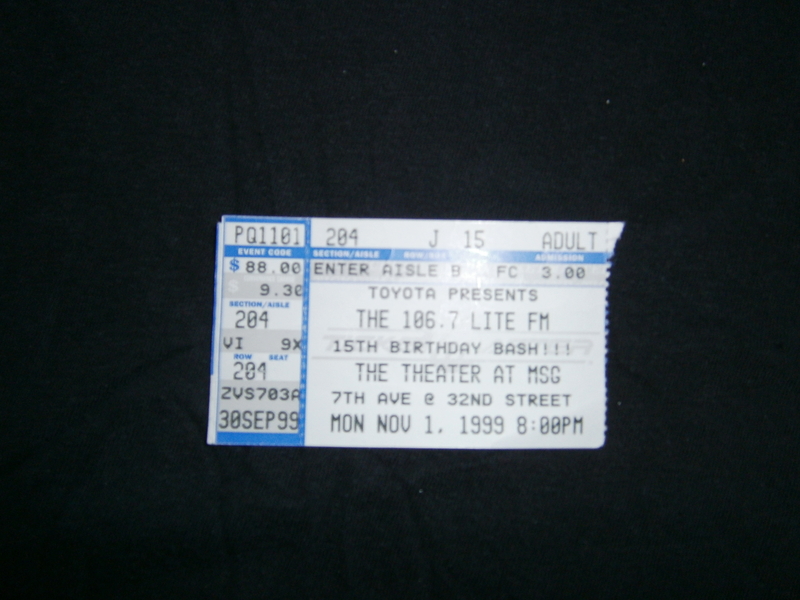 I also went to a concert sponsored by radio station 106.7 Lite FM in 1999 that included separate performances by Gloria Estefan, Phil Collins, Lionel Richie, Mariah Carey, Edwin McCain, and I think 98 Degrees. (It was one of those boy bands that was popular at the time. I never paid any attention to them so I could never differentiate among them). So I guess that adds about 1/6 more of a concert to my totals for Gloria Estefan and Phil Collins. Looking over all the artists I have seen in concert, I am grateful that I was able to see so many legends. The musicians I saw have been popular and touring for decades. 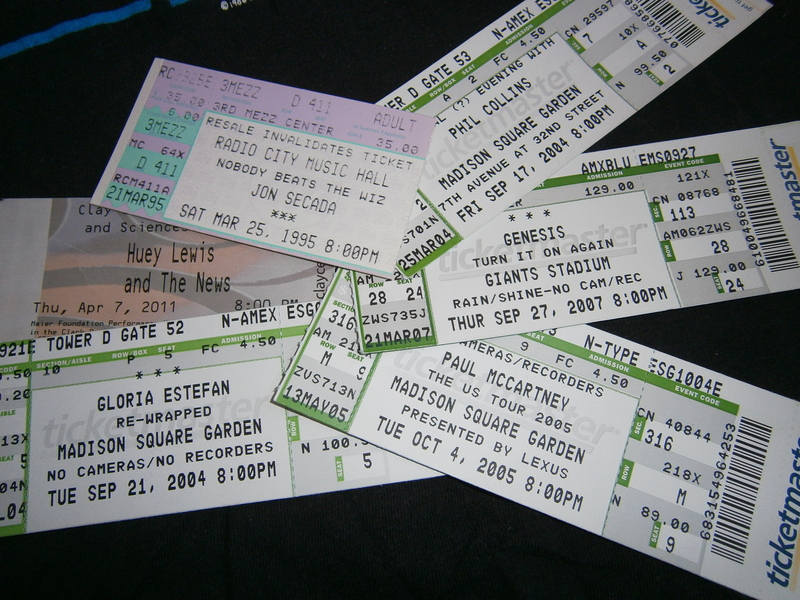 In fact, over 10 years separated many of the concerts I saw by the same musicians. I first saw Paul McCartney in 1990 and last saw him in 2005. I first saw Gloria Estefan in 1990 and then last saw her in 2004. Fifteen years separated the first and last Genesis concerts I saw. It was fourteen years between the first Phil Collins concert I attended in 1990 and the last in 2004. Ten years separated the first and last Barry Manilow concerts I attended. Looking back, 1990 was the best year for me attending concerts as I was able to see my three all time favorites – Gloria Estefan, Paul McCartney, and Phil Collins all in the span of five months. 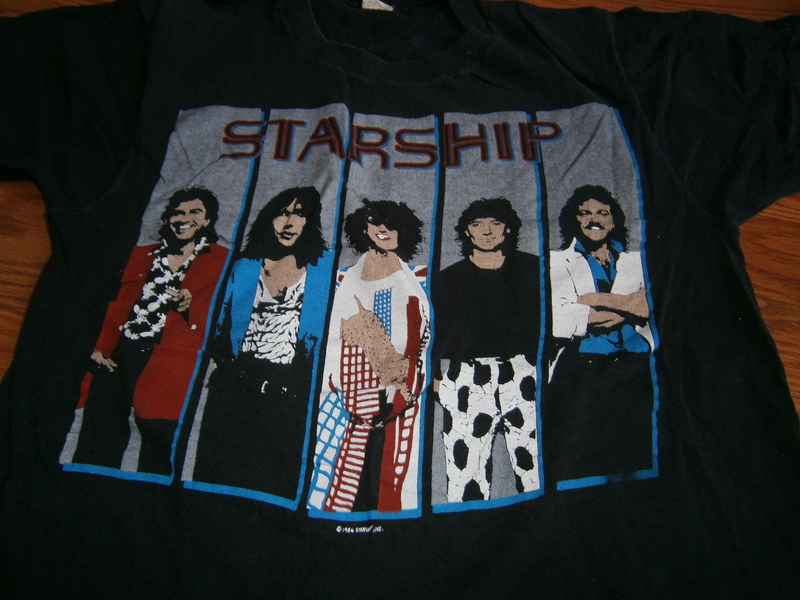 The first concert I attended was Starship. It is the only concert I don’t have a ticket stub for but I think it was in 1986. (I couldn’t find the exact date, even with the help of the excellent website http://www.setlist.fm). The concert was at the then named Garden State Arts Center in New Jersey and the opening act was The Outfield. I remember being impressed with the lighting. I also enjoyed the music even though I didn’t know all the songs. I remember The Outfield playing their hit single “Your Love” from their album “Play Deep”. The Starship songs I liked were “We Built This City” and “Sara” from their 1985 album, “Knee Deep in the Hoopla”. As I noted in my April 11, 2013 post, “The End of Live Concerts by My Favorites” https://guitartrain.wordpress.com/2013/04/11/the-end-of-live-concerts-by-my-favorites/ my time for attending concerts by my favorites may be over. Or is it? Stay aboard the Guitar Train all this month to see if it really is the end. Guitar Train passengers, have you been lucky enough to see your favorite musicians in concert? Who are they, when, and where did you see them? 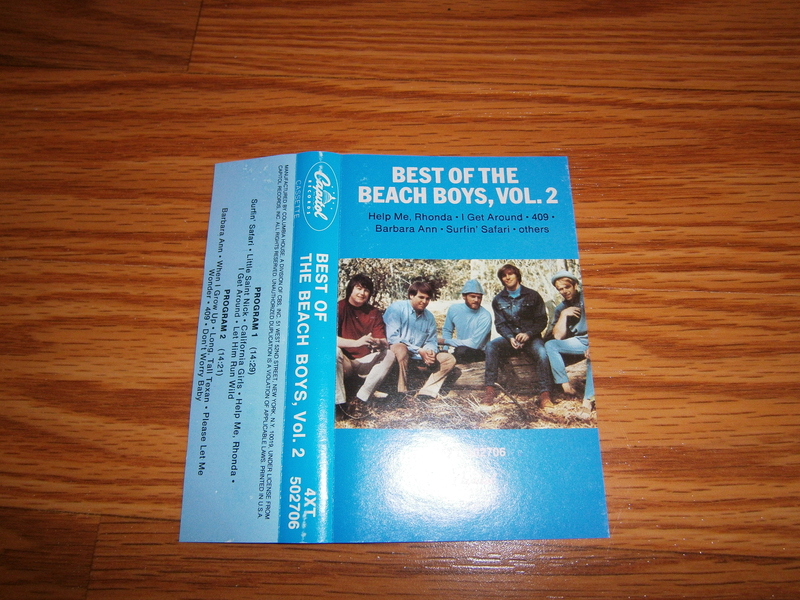 When Quirky T thinks of summer songs, The Beach Boys automatically come to mind. That may be because she lives on the East Coast where she is not sunning and surfing all year long like in California. Only in the summer, can she enjoy the beach and relate somewhat to what The Beach Boys sang about. Guitar Train passengers, which summer songs do you like and why? Tell Quirky T.